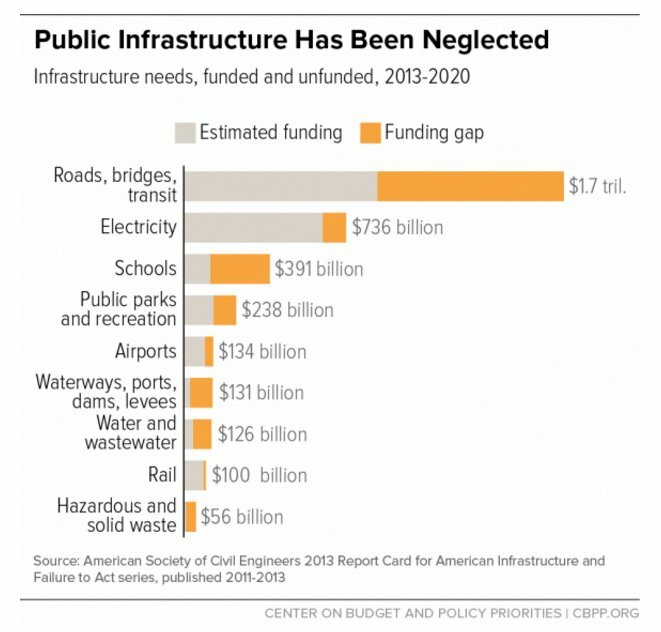 U.S. infrastructure isn't just bad; it's alarmingly bad. An astounding 63,000 bridges across the United States are in urgent need of repair. A third of our roads are in “substandard condition”. A third of automobile deaths can be attributed to "substandard road conditions, obsolete road designs, or roadside hazards." In a ranking of the world's top 100 airports, the U.S. didn't even crack the top 30. In fact, the San Francisco International Airport was the only U.S. airport in the top 50. Over 4,000 of our dams are at risk of failure. U.S. sewer systems spew over a trillion gallons of raw sewage each and every year — at an estimated cost of $50 billion. In fact, some sewer lines in Detroit were installed in the mid-19th century! 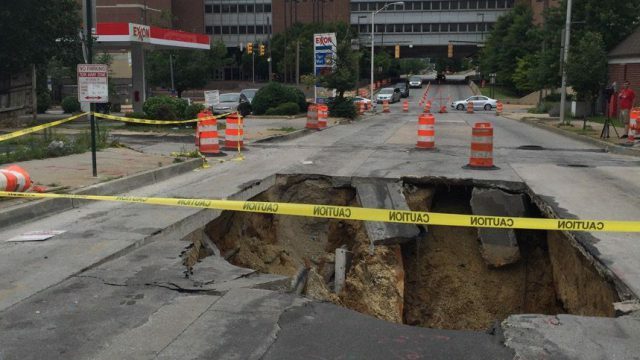 All told, the American Society of Civil Engineers gives the U.S. an overall "D” for infrastructure. The group says we'd need $3.6 trillion by 2020 to keep transportation infrastructure in a good state of repair. 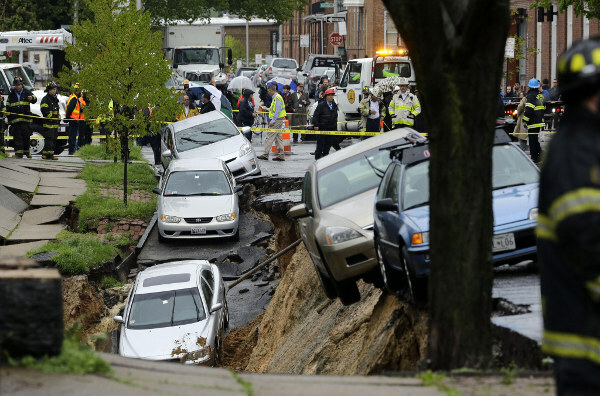 Of course, it's not just Baltimore, or the United States. The whole world is under-invested in infrastructure. The McKinsey Global Institute estimates the world needs to increase investment by about 0.4% of global output between now and 2030 to meet the increasing demand to move people and goods. That translates into $350 billion of annual spending on transportation, power, water, and telecommunications infrastructure. We probably aren't too far way from some massive, government-sponsored infrastructure investment programs. I'm talking about the kind we saw back in 2008, when the financial crisis hit. No doubt, government spending on infrastructure is good for the economy. It means more jobs for road crews and contractors. And it boosts demand for raw material like steel and concrete. I don't know if you've noticed but economic growth remains extremely sluggish. And central banks, which have carried what little growth we've seen, are running out of juice. Interest rates remain at historic lows, some even in negative territory. But again that's good for governments, which can borrow huge sums of money to finance infrastructure programs at little or no added cost. Better still, banks and institutional investors such as pension funds and university endowments have about $120 trillion in assets that could be invested in infrastructure to help close the gap. Combine the need for infrastructure spending with the availability of historically cheap money, stagnant growth in most economies, and trillions of dollars that could be looking for a home, and you have the perfect storm for a coordinated, large-scale program. And that's why investors should be hot on this trend — before it takes off. Caterpillar is the world's largest manufacturer of construction and mining equipment. It shed about a third of its value in the five years from 2011 to 2016, as global growth stagnated and commodities prices crashed. But since then, it's enjoyed a nice rebound, popping up about 30% this year. In fact, it's the Dow's best-performing component. CAT's resurgence isn't being driven by a turnaround in commodities prices or industrial activity, either. Those have yet to return in full. The company's cost-cutting is what's been driving the stock instead. Caterpillar has cut about 16,000 jobs and expects consolidations and closures to impact about 20 of its facilities and 10% of its manufacturing square footage. The company has reduced costs by $1.1 billion year-to-date and is targeting a $2 billion reduction by yea-end. The effort to reduce operating costs by about $1.5 billion annually is likely to increase company's EBITDA by about 20% annually. Indeed, when it comes to investing efficiency is often the best substitute for growth. And that's what CAT is bringing. Now, it's just a matter of waiting for demand to pick back up. That's when the real fireworks will begin. There's been a bit of new hope recently, as construction-related activity is gaining momentum. The Architecture Billings Index (a leading indicator of U.S. non-residential construction) has remained above 50 in recent months, signaling robust conditions ahead for the construction industry. Mining could also improve, as the commodities slump has abated. The announcement of a major infrastructure package would send CAT soaring. The stock is currently trading at a 52-week high, so it may be best to wait for a pullback before building a stake. Even still, it does pay a dividend that yields 3.4%. That's a nice “pay while you wait” bonus. China spends more on economic infrastructure annually than North America and Western Europe combined. It has a huge pile of reserves, which means it doesn't even need to borrow money to splash the pot. It also has an efficiently-managed, single-party government determined to manufacture economic growth. Beijing has already deployed more than $2 trillion for infrastructure projects, and another trillion is in the pipeline. Earlier this year, the National Development and Reform Commission and Ministry of Transport released the detail plans to speed up transport infrastructure investment between 2016-18. It involves 303 projects with an aggregate investment amount of roughly $700 billion. There are 86 railway projects, 103 subway projects, 54 highway projects, 50 airport projects, and 10 seaport projects. Of course, China's stock market is tightly regulated and often volatile. Still, for such speculators, Aluminum Corp. of China, an ADR traded on the New York Stock Exchange, would be the play. The state-owned company produces aluminum and mines coal, with a little over $5 billion in assets. But since then, prices have bounced back. 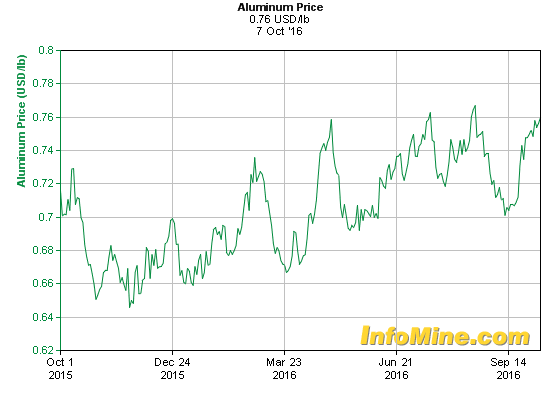 Supplies have dwindled and demand has picked back up — so much so that we're now facing an aluminum shortage. "The aluminum market has in fact found its stabilization point this year for the first time in five years," Oleg Mukhamedshin, Deputy Chief Executive of aluminum giant Rusal, said at the Reuters Russia Investment Summit in Moscow. "We expect the global deficit to be 700,000-800,000 tonnes this year. The figure is quite symbolic, taking into account expected consumption of 60 million tonnes. It is important because it shows the market is pulling out of the situation of excessive production." This coincides with a rally in ACH shares, which are up more than 17% this year, trading above $9. They'll certainly go higher as China unveils more stimulus programs. If the Flint water crisis has taught us anything, it's that America's water infrastructure is in desperate need of repair. The American Society of Civil Engineers has said water infrastructure will cost at least $1 trillion in the U.S. alone. We're unlikely to see that much spent, but the EPA estimates that at least $662 billion will be required for water infrastructure rebuilding over the next two decades. We mustn't forget that water scarcity and treatment is a global concern. 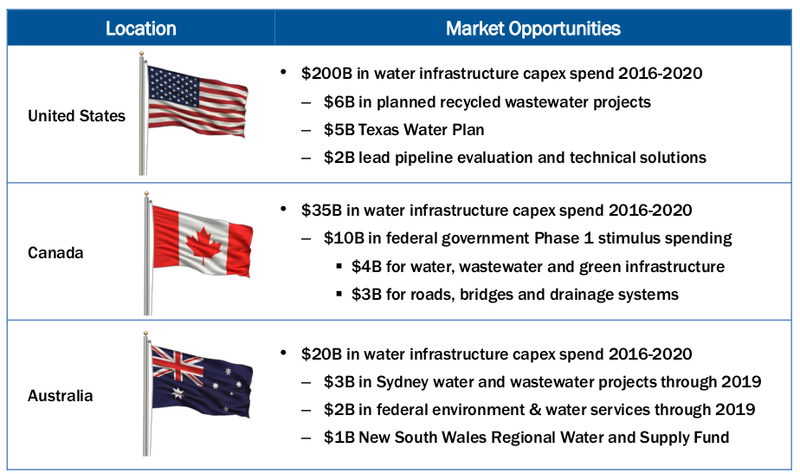 So the outlook for water pipeline and treatment companies is strong. One such company is Tetra Tech — a leading provider of consulting, engineering, program management, and construction management services. Tetra Tech was just awarded a $29 million contract for water supply, sanitation, and hygiene partnerships by USAID and a $400 million contract from the U.S. Department of Energy. They company also has operations in Europe, Asia, the Middle East, and Australia. It generates $2.7 billion in annual revenue building dams, reservoirs, water treatment, and waste management plants. Tetra Tech's most recent quarterly statement showed $667 million in revenue, $500 million in net income, and a backlog of $2.3 billion. All of those were significant year-over-year increases, as well. The stock itself is up 40% over the past year. Obviously, not all pipelines carry water. Some carry oil. And they're in increasing demand now that U.S. energy companies have unlocked huge amounts of gas and oil through shale drilling. Kinder Morgan is a leviathan in the pipeline business, with operating interests in roughly 84,000 miles of pipelines and 180 terminals. The company got a huge boost recently when it received approval from the Federal Energy Regulatory Commission (FERC) for its proposed Elba Island LNG export plant near Savannah, Georgia. The permit is for the expansion of the existing Elba Island LNG Terminal through the addition of $2 billion in liquefaction equipment. The firm also announced FERC certificates for $300 million in pipeline expansion work to boost gas supply to the site and to other industrial consumers. That work should be completed towards the end of this year. The company got banged up as oil prices crashed, but it's since shifted focus on cutting debt and repairing its balance sheet. It sold off some pipeline projects and signed up joint-venture partners to shoulder some of its current project costs. Kinder Morgan retains a $13.5 billion backlog, and expects to resume steady dividend increases in 2017. 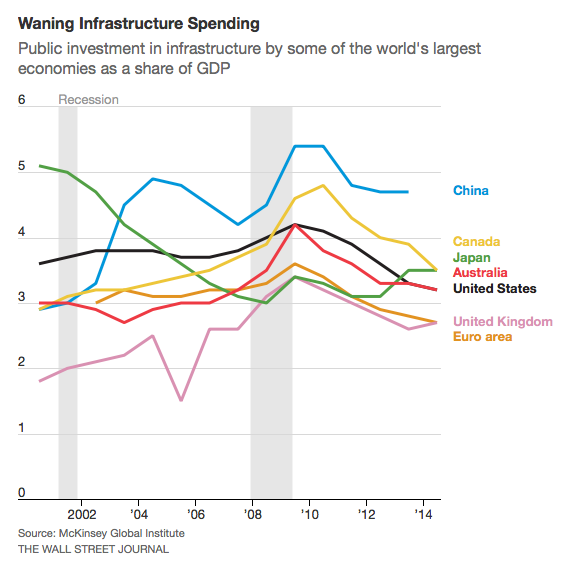 The bottom line is that global growth is weak and infrastructure is under-invested. Governments are already ramping up spending in an effort to boost growth and address the very real issues facing the world today. Trillions more in spending is coming down the pike — especially with new leadership taking the helm in the United States. Investors ought to invest before the wave hits.